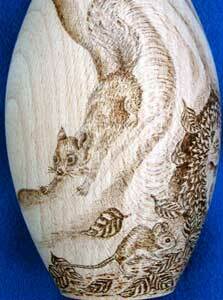 This solid beech decorative vase (approx 6" high) has a woodland theme. The wraparound scene has been designed in such a way that it can be viewed from three different angles to form a complete picture. This piece is now held in the collection of a Finnish customer. A thumbnail sketch of the basic idea for the layout was first prepared on paper. 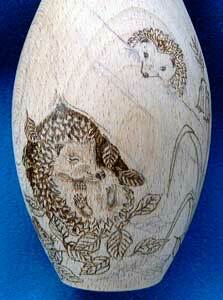 Chosen to reflect the type of wood from which the vase is made, a beech tree sets the scene for a newly awoken hedgehog peering over at another still in hibernation at the base. 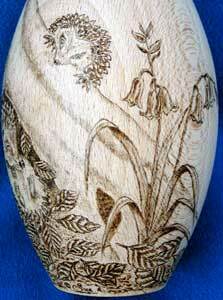 Using a soft 2B pencil, the design was lightly sketched and further developed directly on the vase. 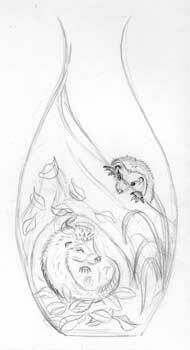 Burning commenced with the two hedgehogs as the main focal point of the piece, using the pencil lines as a guide. A woodmouse searching for nuts amongst the beech leaves provides added interest to the front view of the completed scene. A grey squirrel scampering down the tree provides a focal point for the left view of the scene, while a clump of bluebells growing at the base is a focal point in the right view. 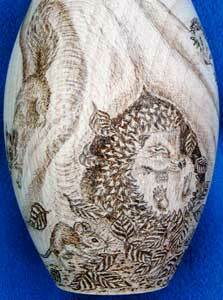 On completion the vase was sealed with three coats of a non-yellowing satin varnish and given a baize lined base.